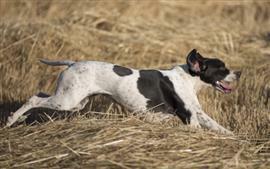 The Pointer’s close ties to bird hunting make hunting and gun related names the most popular selection. Remmy, Bullet, Smith, and Wesson are a few common ideas. Names that relate to the act and appearance of pointing include Dart, Bolt, Mark, and Arrow. Particularly popular in the Southern US, the Pointer bears a variety of redneck names like Cooter, Buck, Rebel, and Shooter. Other country themed names can be inspired by pretty much anything you would typically found out in the backwoods. One unique idea is to name your Pointer after farm equipment. Deere, Case, and Hopper are just few ideas that fall into this category. Outside of the country theme, many owners choose an English name due to the roots of the breed. English favorites are Darwin, Charles, and Elizabeth or Lizzy. Some of our pages will contain a subcategory. A subcategory is a slightly more specific grouping than the main topic of the page. For a subcategory, we will include a separated table of names and corresponding descriptions. An example of a subcategory of Red Dog Names would be 'Dog Names Inspired by Red Wines'. If you have any subcategory ideas for the Pointer Names page, we would love to hear them. Use the form below to submit your ideas.